7 November 2014, at 12:00a.m. Feeding alternative feedstuffs may reduce feed costs per unit of pork produced but also provides challenges to achieve cost-effective, predictable growth performance, animal health, environmental footprint, carcass characteristics and pork quality, Ruurd T. Zijlstra (University of Alberta) and Eduardo Beltranena (Alberta Agriculture and Rural Development) told the London Swine Conference 2014. Fibre is one of the four macronutrients that yield energy (others are starch, fat, and protein). Effects of high fibre diets may depend on diets being balanced for energy value or not. To yield energy for pigs, fibre must be fermented in the gastro-intestinal tract and be metabolised into volatile fatty acids (VFA). High dietary inclusion of alternative feedstuffs such as co-products may cause high fibre diets for swine. In nursery diets, high fibre diets were thought to reduce feed intake, and thereby hinder energy intake during the energy-dependent phase of growth. However, such a relation is not proven to be solid across the spectrum of dietary fibre and other factors may play a role. Fibre characteristics may play a role in gut health. In grower-finisher pigs, high fibre diets are known to increase viscera mass, and thereby reduce dressing percentage at slaughter. Overall, high fibre diets have a lower energy digestibility and a lower feed efficiency is thus expected. However, depending on prices of alternative feedstuffs, high fibre diets may be part of a range of solutions to reduce the feed cost per unit of gain, and may thereby support an economically-sustainable pork industry in Canada. Practically, feed of diets to swine that are greater in fibre content than a diet based on corn and soybean meal is usually is caused by increased dietary inclusion of alternative ingredients such as co-products (Zijlstra and Beltranena, 2013ab; Woyengo et al., 2014). Obviously in North America, co-products from the bio-fuel industry are an important component of alternative ingredients (Shurson et al., 2012). As omnivores, pigs are ideally suited to convert non human edible feedstuffs into high quality food animal protein. Dietary inclusion of co-products from food and bio-fuel production will considerably improve the human-edible protein balance (edible protein output/input) of swine production. Compared with traditional diets based on a single grain as an energy source and soybean meal as a protein source, feeding high inclusion levels of co-products has a greater risk, including the greater content of dietary fibre. This risk can be managed using modern feed formulation such as net energy and standardized ileal digestible amino acids, feed evaluation such as near infra-red reflectance spectroscopy, feed enzymes to degrade fibre, and feed processing to reduce the impact of dietary fibre (Zijlstra and Beltranena, 2013b). Combined, these methods may then support pork producers to attain predictable swine growth performance, carcass characteristics, and pork quality. Previously, we reviewed fibre digestion, absorption of its metabolites, and the impact of digestive physiology in the pig (Zijlstra et al., 2012). Among labs, our lab also has used in vitro fermentation methods to mimic in vivo digestion of fibre (Jha and Leterme, 2012). fibre can be important for energy metabolism of the pig. fibre varies greatly in characteristics such as fermentability and viscosity that are important for its ability to affect physiological functions (Dikeman and Fahey, 2006.). In the gut, fibre via its metabolites may directly stimulate physiological functions via local endocrine responses (Hooda, 2010). Obviously, because fibre cannot be digested by the pig itself, it is fermented by the gut microbiota. A combination of digesta passage rate, fermentability and viscosity that are all influenced by fibre contributes to nutrient availability and commensal bacteria colonisation in the lower gastrointestinal tract (Metzler-Zebeli et al., 2010). Interest in feeding an array of feedstuffs in diets of pigs was tweaked by an experiment where diets ranging from 2.37 to 2.19Mcal of NE per kg were fed to young pigs (Beaulieu et al., 2006). Diets were formulating by replacing mostly oat groats with barley to reduce the dietary energy value. Consequently, the acid-detergent fibre (ADF) content increased from 2.5 to 4.0 per cent, respectively. In contrast to expectations (Nyachoti et al., 2004), young pigs fed the diets containing less energy and more fibre had the greatest feed intake and gain but a reduced feed efficiency (Beaulieu et al., 2006). These data indicated that young pigs may not always respond negatively to diets with a high fibre content. To explore, we included alternative feedstuffs into diets for young pigs to replace soybean meal in a series of experiments (Table 1). These feedstuffs included wheat distillers dried grain with solubles (Avelar et al., 2010), solvent-extracted and expeller-pressed canola meal generated from Brassica napus (Landero et al., 2011, 2012a; Seneviratne et al., 2011), solvent-extracted canola meal generated from Brassica juncea (Landero et al., 2013). Occasionally, the authors also test alternative feedstuffs in the pulse seed family with a crude protein content ranging from 20 to 30 per cent that replace soybean meal and some wheat. This group included lentil (Landero et al., 2012c). Interestingly, while increased dietary acid-detergent fibre consistently reduced energy digestibility, effects on reduced feed intake were not consistent (Table 1). Finally, in our pilot-facility we can create our own feedstuff such as air-classified, solvent-extracted canola meal (Zhou et al., 2013). 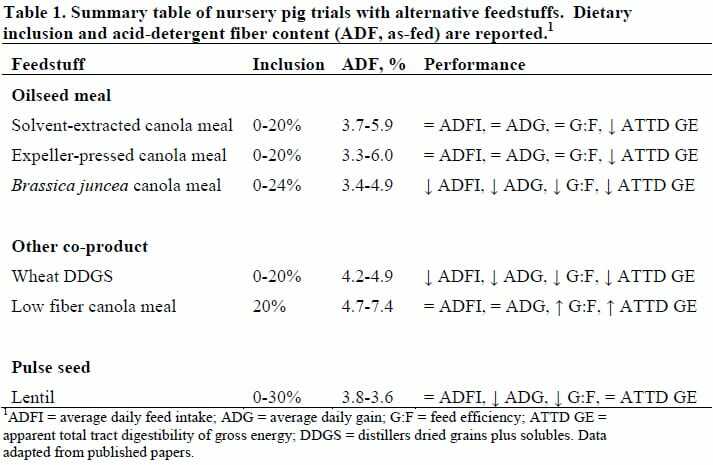 Interestingly, while pigs have strong preferences for certain feeds and feedstuffs (Landero et al., 2012b), fed diets including alternative protein feedstuffs can achieve a growth performance equivalent pigs fed a diet based on soybean meal (Landero et al., 2011, 2012a). In each of the experiments above, diets were formulated to equal net energy value and standardized ileal digestible amino acids. Therefore, effects of the test ingredient cannot be attributed to a lower formulated energy value or amino acid content. 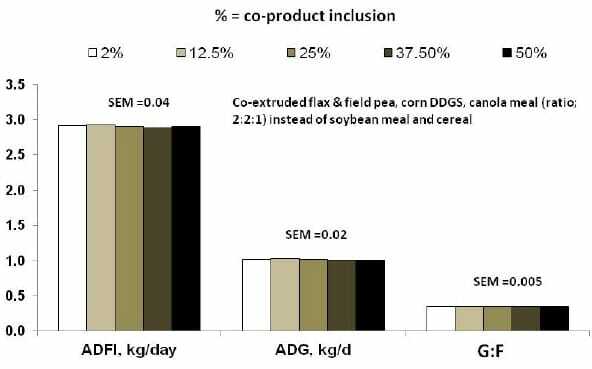 Using a similar approach for grower-finisher pigs, by including increasing co-products such as expeller-pressed canola meal or a combination of co-products, growth performance of pigs fed increasing dietary inclusion of co-products may not reduce growth performance (Figure 1). (adapted from data of Exp. 2 of Jha et al., 2013). Obviously, responses of pigs to increasing dietary inclusion of co-products are not consistent among experiments. Pigs in some experiments have reduced growth performance (Seneviratne et al., 2010; Experiment 1 of Jha et al., 2013), whereas growth performance remained consistent in others (Exp. 2 of Jha et al., 2013). Consistently among experiments, carcass weight at increasing dietary inclusion of coproducts was reduced at a similar slaughter body weight. This reduction indicates that increasing dietary co-products inclusion and, consequently, increasing dietary fibre reduced dressing percentage (Seneviratne et al., 2010; Jha et al., 2013). Pigs adapt to diets with increased fibre content by increasing gut volume and weight (Jørgensen et al., 1996). Increasing dietary co-products inclusion increased viscera weight, which in turn increased the energy and amino acid requirements of these organs in pigs (Yen, 1997; Nyachoti et al., 2000). Therefore, increased viscera size and weight at equal intake of net energy and standardized ileal digestible amino acids may reduce protein deposition in the carcass and thereby reduce loin depth (Jha et al., 2103). An increased dietary inclusion of dietary threonine that is linked to fibre content in the diet is important to alleviate some of this effect (NRC, 2012). One critique of research with increasing dietary inclusion of alternative feedstuffs has been that testing of single feedstuffs might not be relevant practically. Therefore, we conducted trials with grower-finisher pigs by adding increasing dietary co-products into diets that included DDGS co-fermented from wheat and corn (Smit et al., 2014). Increasing dietary canola meal inclusion decreased the apparent total tract digestibility coefficient of gross energy. For the entire trial, increasing dietary canola meal canola meal inclusion linearly reduced feed intake and weight gain. Increasing dietary CM inclusion quadratically reduced feed efficiency. Increasing dietary CM inclusion in diets including 15 per cent DDGS did not affect carcass weight, dressing, backfat thickness, loin depth, and estimated lean yield. We concluded that grower-finisher barrows and gilts can be fed diets including up to 24 per cent canola meal together with 15 per cent wheat DDGS without having major effects on pig growth performance, carcass dressing or carcass characteristics. For the long-term sustainability of swine production, economics, societal acceptance, and the environment are key components. Dietary inclusion of co-products and less reliance on cereal grains are important, but such diets will contain more fibre than traditional. As an omnivorous species, the pig is suited to efficiently convert co-products to pork products, but feeding co-products also provide challenges and opportunities. In conclusion, feeding alternative feedstuffs may reduce feed costs per unit of pork produced, but also provides challenges to achieve cost-effective, predictable growth performance, animal health, environmental footprint, carcass characteristics and pork quality. Acknowledgements: The funding received from industry and provincial and federal government sources to support the discussed research is much appreciated. The author enjoys the strong collaborations with his research group that stimulated and completed this research. This research could not have been completion without the dedication of the post-doctoral fellows, graduate students and research technicians who executed the research from start-to finish. Avelar, E., R. Jha, E. Beltranena, M. Cervantes, A. Morales and R.T. Zijlstra. 2010. The effect of feeding wheat distiller’s dried grain with solubles on growth performance and nutrient digestibility in weaned pigs. Anim. Feed Sci. Technol. 160:73–77. Beaulieu, A.D., C.L. Levesque and J.F. Patience. 2006. The effects of dietary energy concentration and weaning site on weanling pig performance. J. Anim. Sci. 84:1159–1168. Dikeman, C.L. and G.C. Fahey, Jr. 2006. Viscosity as related to dietary fibre. A review. Crit. Rev. Food Sci. Nutr. 45:649–663. Hooda, S. 2010. The role of functional properties of dietary fibre in the control of nutrient flow and intestinal health in pigs. Ph.D. Diss. Univ. of Alberta, Edmonton, AB, Canada. Jha, R., J.K. Htoo, M.G. Young, E. Beltranena and R.T. Zijlstra. 2013. Effects of increasing co-product inclusion and reducing dietary protein on growth performance, carcass characteristics, and jowl fatty acid profile of grower-finisher pigs. J. Anim. Sci. 91:2178–2191. Jha, R. and P. Leterme. 2012. Feed ingredients differing in fermentable fibre and indigestible protein content affect fermentation metabolites and faecal nitrogen excretion in growing pigs. Animal 6:603–611. Jørgensen, H., X.Q. Zhao and B.O. Eggum. 1996. The influence of dietary fibre and environmental temperature on the development of the gastrointestinal tract, digestibility, degree of fermentation in the hind-gut and energy metabolism in pigs. Br. J. Nutr. 75:365–378. Landero, J.L., E. Beltranena, M. Cervantes, A. Morales and R.T. Zijlstra. 2011. The effect of feeding solvent-extracted canola meal on growth performance and diet nutrient digestibility in weaned pigs. Anim. Feed Sci. Technol. 170:136–140. Landero, J.L., E. Beltranena, M. Cervantes, A.B. Araiza and R.T. Zijlstra. 2012a. The effect of feeding expeller-pressed canola meal on growth performance and diet nutrient digestibility in weaned pigs. Anim. Feed Sci. Technol. 171:240–245. Landero, J.L., E. Beltranena and R.T. Zijlstra. 2012b. Growth performance and preference studies to evaluate solvent-extracted Brassica napus or Brassica juncea canola meal fed to weaned pigs. J. Anim. Sci. 90(Suppl. 4):406–408. Landero, J.L., E. Beltranena and R.T. Zijlstra. 2012c. The effect of feeding lentil on growth performance and diet nutrient digestibility in weaned pigs. Anim. Feed Sci. Technol. 174:108–112. Landero, J.L., E. Beltranena and R.T. Zijlstra. 2013. Diet nutrient digestibility and growth performance of weaned pigs fed solvent-extracted Brassica juncea canola meal. Anim. Feed Sci. Technol. 180:64–72. Metzler-Zebeli, B.U., S. Hooda, R. Pieper, R.T. Zijlstra, A.G. van Kessel, R. Mosenthin and M.G. Gänzle. 2010. Non-starch polysaccharides modulate bacterial microbiota, pathways for butyrate production, and abundance of pathogenic Escherichia coli in the gastrointestinal tract of pigs. Appl. Environ. Microbiol. 76:3692–3701. Zijlstra R.T. and E. Beltranena 2014. High fibre swine diets. Proceedings of the London Swine Conference. London, Ontario, Canada. 26 to 27 March 2014. p80-85.